A doctor has been slammed after taking a selfie from a delivery room, with a new mother lying naked in the background. 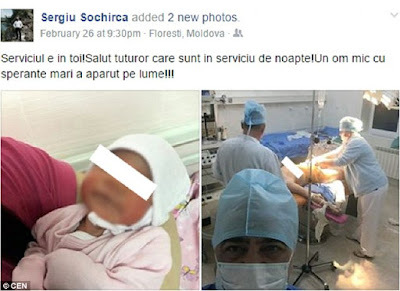 Dr Sergiu Sochirca, a former director of the local hospital in Floresti, north-east Moldova, then posted the inappropriate self-portrait on his Facebook. The post was widely shared on social media in Moldova, and the National Ministry of Health has now demanded his suspension. Dr Sochirca posted two photos on his Facebook account, the first one is a selfie from the operation room, showing a naked woman on a hospital bed behind him. The second photo shows the newborn being held by a nurse for the doctor to take a photo. The controversial Facebook post went viral in Moldovam and was published by local media, sparking a national controversy.